CARFAX 1-Owner, ONLY 3,823 Miles! PRICE DROP FROM $36,995, $5,800 below NADA Retail! FUEL EFFICIENT 32 MPG Hwy/22 MPG City! Nav System, Moonroof, Heated/Cooled Seats, Turbo Charged Engine, Back-Up Camera, NAVIGATION SYSTEM. NAVIGATION SYSTEM Lexus Enform Destinations, destination assist and eDestination ( included, requires Lexus enform safety connect), Lexus Enform App Suite (Subscription Free), destination search, Yelp, iHeartRadio, Facebook Places, Movietickets.com, OpenTable, Pandora, slacker, stocks, fuel prices and sports, Lexus Insider, Radio: Lexus Display Audio w/Navigation System, AM/FM/in-dash CD, HD Radio (complimentary traffic and weather), 10.3" screen w/back button on remote touch interface controller, 10 speakers, 293-watts, digital signal processing w/Automatic Sound Levelizer (ASL), integrated SiriusXM satellite radio receiver (complimentary included), Scout GPS link, iTunes tagging, MP3/WMA and dual USB/iPod audio input plugs, rear, ACCESSORY PACKAGE 2 Cargo Net, Carpet Trunk Mat, Rear Bumper Applique, Key Gloves, Alloy Wheel Locks. 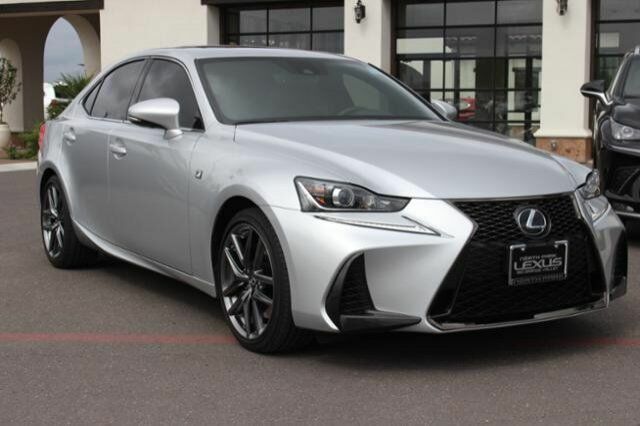 KBB.com explains "The Lexus IS delivers the speed, handling, comfort and luxury expected of a premium European brand, but with the kind of reliability and resale history for which Lexus is famous. Expressive styling sets the IS apart from most in this class. ".